The NPS maintains the Zion Canyon Visitor Center and Zion Human History Museum. Ranger programs are offered and a schedule is posted at the visitor center and the museum. Programs range from Zion history and folklore to talks about biology, geology, flora and fauna. Both of these buildings are found along the Zion-Mt. Carmel Highway and can be accessed in your private vehicle. The original Visitor Center, which was actually a rangers cabin, was built at the Grotto in the 1920's. The current museum was the next Visitor Center which was built in the 1950's. The current building was constructed in 2000 and made to conserve energy and help keep the air in and around Zion clean. The first year after the center's construction, it consumed 70-80% less energy than other buildings of its size. The Zion Canyon Visitor Center is open daily from 8 am to 5 pm, with extended hours in the spring, summer, and fall. The large building is filled with displays and information about the park. Ranger talks offered late March through November are held outside on the patio. These mini-presentations can be a nice break from hiking and driving and of course are quite educational. Just a short jaunt down the Zion-Mt. Carmel Highway is the Zion Natural History Museum. Inside the museum are more park displays demonstrating the history, flora, fauna, geology and other aspects of the park. An outstanding, twenty-two minute film plays throughout the day explaining how this Utah park was formed. There is no fee to watch. Behind the beautiful old museum is an incredible view of some of Zion National Park's landmarks, including the West Temple, Sundial and Altar of Sacrifice. 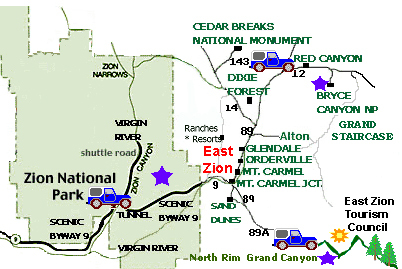 If you are up for some "off the beaten path" adventures, the east side of Zion National Park offers Orderville Canyon, East Rim, Shelf Canyon, Two Pines Arch, Hidden Arch, Checkerboard Arch, Tunnel Canyon, Hidden Gardens, Many Pools, Pine Creek, Jug handle Arch, Clear Creek, among many others. Parunuweap is riddled with slot canyon tributaries, and offers quiet isolation. Although few venture into the East Fork, it rivals the famous North Fork (Zion Narrows) in beauty and adventure. In 1917 Zion Lodge was built in Zion Canyon to accommodate tourists who flocked to the area. Two-years later, Mukuntuweap National Monument was proclaimed as Zion National Park. In 1930, the Zion-Mt Carmel highway was completed which opened up the canyon to the east side of the park. This also gave easy access to Bryce Canyon and the Grand Canyon. The Zion Human History Museum, located along the Zion-Mt. Carmel Highway, has informative displays on the human history of the area. Evidence shows humans have been there for a very long time, dating back to 500 A.D., a time when the ancestral Puebloans (Anasazi) hunted the megafauna that roamed the earth. Private vehicles can travel SR-9, from Zion's south entrance, out the east entrance (or visa versa) to the junction of SR-9 & US-89 year-round, 24 hours a day. See tunnel restrictions for Oversized Vehicles. In summer, the only access to the Scenic Zion Canyon Drive is via Zion's shuttle, but during the winter private vehicles can travel in the canyon. Exact dates the shuttle runs may vary. Zion National Park offers a program were visitors can spend the day with park science technicians, learning about current resource management issues. The goal is the preservation of the native plants in the Zion National Park area. 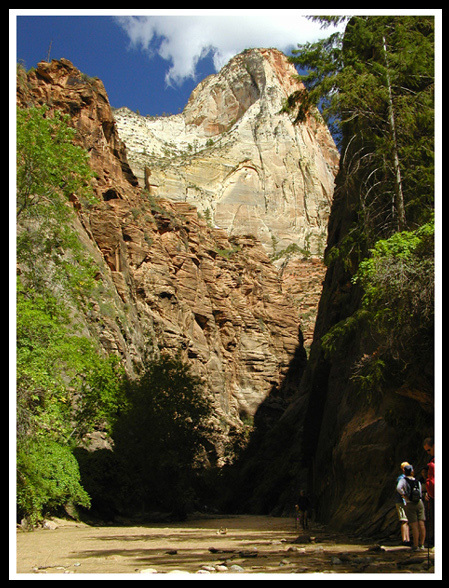 Participants will learn plant identification and experience Zion's backcountry with qualified scientists or rangers. Call for more information: 1.435.772.0218. Zion also offers other events, throughout, the year that are science oriented.